Spray 3 1/2- to 4-quart slow cooker with cooking spray. 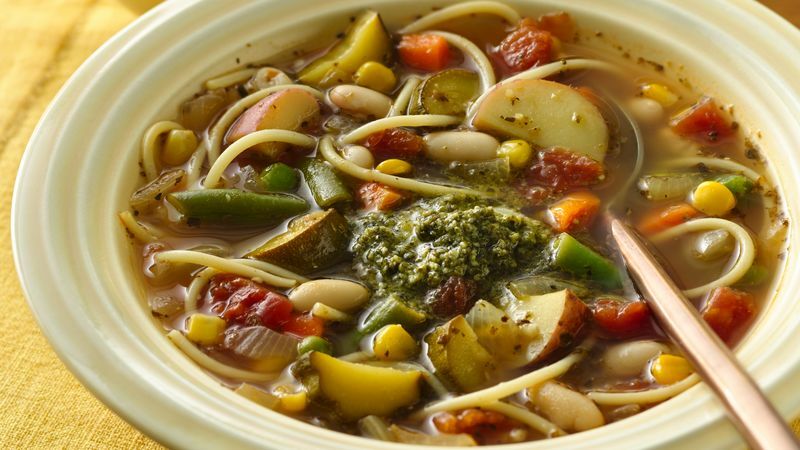 In cooker, mix all ingredients except mixed vegetables, spaghetti, beans and pesto. Cover; cook on Low heat setting 7 to 9 hours. Stir in mixed vegetables, spaghetti and beans. Increase heat setting to High. Cover; cook 20 minutes longer. Garnish each serving with about 1 1/2 teaspoons pesto. If desired, substitute other types of pasta for the thin spaghetti. Choose small shell macaroni, ditali or other smaller pastas. By using reduced-sodium broth in a soup, you can season the soup to taste. Just before serving, taste and add additional salt and pepper if desired.